Installation file contains the full instructions for installing your GNS530, including how to configure your realityXP file, the FSUIPC file, and how to setup the display to fit the screen. The user guide is a simple to follow guide to get you set-up quickly and easily and explains the integrated functionality of the GNS530 Hardware, such as how to adjust the screen and backlighting feature. Over 12 months in development, Emuteq is pleased to bring you unparalleled realism in flight simulation. 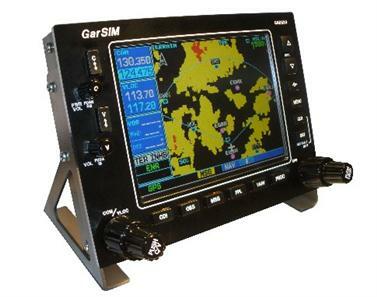 The GarSIM GNS530 is closely based on the real world Garmin GNS Aviation Navigation unit. Designed to work in conjunction with the excellent Reality XP software, our hardware interface completes the package. We have taken care to design the unit as an almost 1:1 scale replica of the original. Is the GNS compatible with FS2004, FSX and X-plane? The hardware is compatible with the Reality XP software on FS2004 and FSX with compatibility for X-plane coming soon. Is the GNS compatible with all versions of Windows and Mac? The unit has been tested on Windows XP, Vista, Windows 7 and Mac OS X and is true plug and play. Once connected via USB, the unit is recognised as a GarSIM530 game controller and can be tested just like any other controller. At present the Reality XP software is not supported on Mac systems, however we have future-proofed our hardware. I already have the GNS430 software from Reality XP, will the hardware still work with this? Yes, the unit can work with either the 430 or the 530 software from Reality XP. The functionality is exactly the same. You can also purchase two units if you wish to control two seperate Reality XP gauges. Is a registered copy of FSUIPC required? Yes, a registered copy of Peter Dowson's excellent FSUIPC software is required, it can be downloaded from here. We would also recommend this software for the functionality and improvement it offers to your sim in many other ways. Could this hardware be configured to work with the standard Microsoft FS GPS that comes with the sim? Although we have not tested this, there is no reason that the unit could not be mapped to work with the standard FS GPS, however the functionality is nowhere near that of the Reality XP software, which runs off the Garmin training software so is a near perfect representation of the real Garmin unit. Do I need a power supply to power the screen? No, the screen is powered by USB power so no additional power supply is required. We have included a 12V DC power supply socket on the back of the unit just in case your PC does not provide enough power. Yes, the included desk stand brackets are removable, there are captivated M3 Nuts in either side of the case to aid in panel mounting. Recommended panel cut-out dimensions are 169mm x 125mm with max 3mm corner radius. Do you hold the GarSIM GNS in stock? Yes, we hold a very small quantity in stock, and the unit will usually ship within 5 working days after payment is recieved. All shipping is with the big name companies. We use airmail as standard so shipping normally takes a week or so. Can I run Flightsim in full screen mode? No, the Reality XP software is a gauge within the sim, Microsoft FS does not support full screen mode across additional monitors where the gauge is dragged over to a second monitor. If reality XP get around this in the future, our hardware is fully supported as the screen can be adjusted to suit. Can I turn off the backlighting feature? Yes, the backlighting is fully scaleable to suit your personal taste. Optional 12V DC input for screen power. Detatchable desk stand for panel mounting.